I’ve been a mom for nearly two years now, but a lot of times I still feel really clueless. A lot of things are googleable, fortunately, although of course what worked for some may not work for others. Much of the time, you really just have to learn through experience, by plowing through it all, bloopers and all, cluelessness and all. For example, Halloween. I mean, what is that. I grew up with no concept of Halloween as it is commonly celebrated now, with candies and costumes and kiddie events. When I was growing up November 1 was simply “Undas,” where instead of going to a party you go to the cemetery, and instead of collecting candies you collect the melted wax slowly trickling down the lit candles in front of your dead relatives’ graves. It could also be some sort of family event, though, since you get to meet your other (living) relatives in the cemetery and sit around eating and chatting and, in the case of one memorable Undas year for me, learn to play tong its from your cousins. That sort of thing is still done now, of course, but somehow somewhere along the way we’ve also picked up the western way of celebrating Halloween by dressing up in costumes and going trick or treating. And apparently, in the kid world, it’s become kind of a big deal. I used to feel iffy when I first observed this development years ago. Medyo imbyerna lang. I was all, why are we imitating Western customs? Now, however, the practice is so widespread, so I just shrug my shoulders and think, well, resistance is futile. If this is a fun way of injecting a bit fantasy and magic to my kids’ lives, then I guess I’m ok with having them dress up in costumes and participate in a fun event or two. 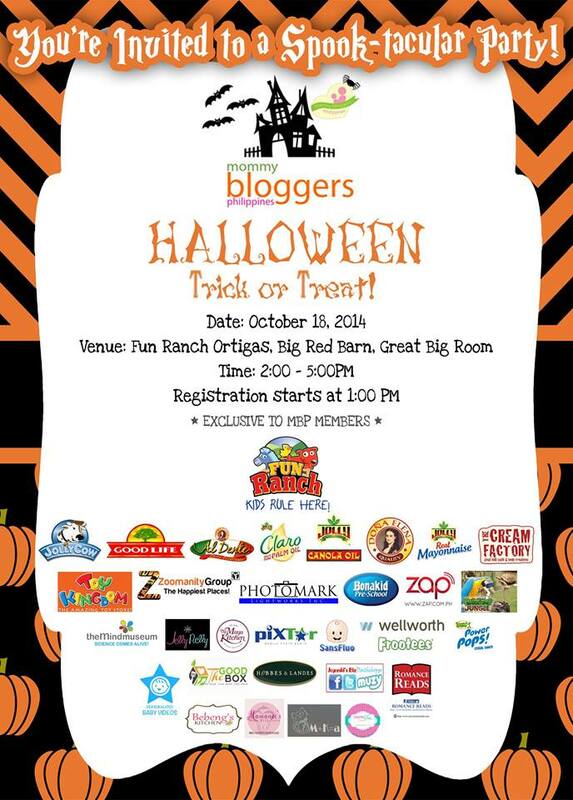 Now, all this is actually just one long intro to an account of the event we attended last weekend, the first Halloween party of Mommy Bloggers Philippines, a Facebook-based group of, well, mommy bloggers of which I am a member. It was my first time to attend an event with the group and actually only my second blogging-related event, the first being the Ogalala event which was open to everyone anyway. It was also the twins’ first Halloween/trick or treat event. Yey: I dressed up the twins in fun, hassle-free costumes. 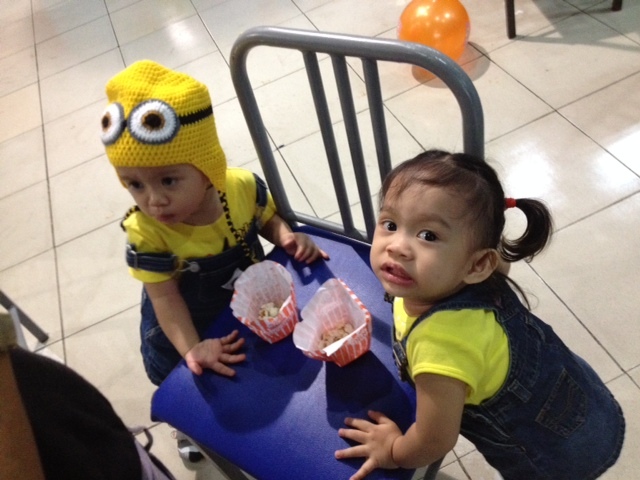 Their age and likot tendencies, the limits of my creativity/craft skills, and my unwillingness to buy ready-made department store costumes were major factors in my decision to dress them up as minions from the film Despicable Me. We already had minion bonnets bought last year, which they haven’t really used beyond a photo opp or two. So it was only a matter of dressing them up in denim jumpers and yellow shirts, and cutting up some old socks to make the logo/patches. 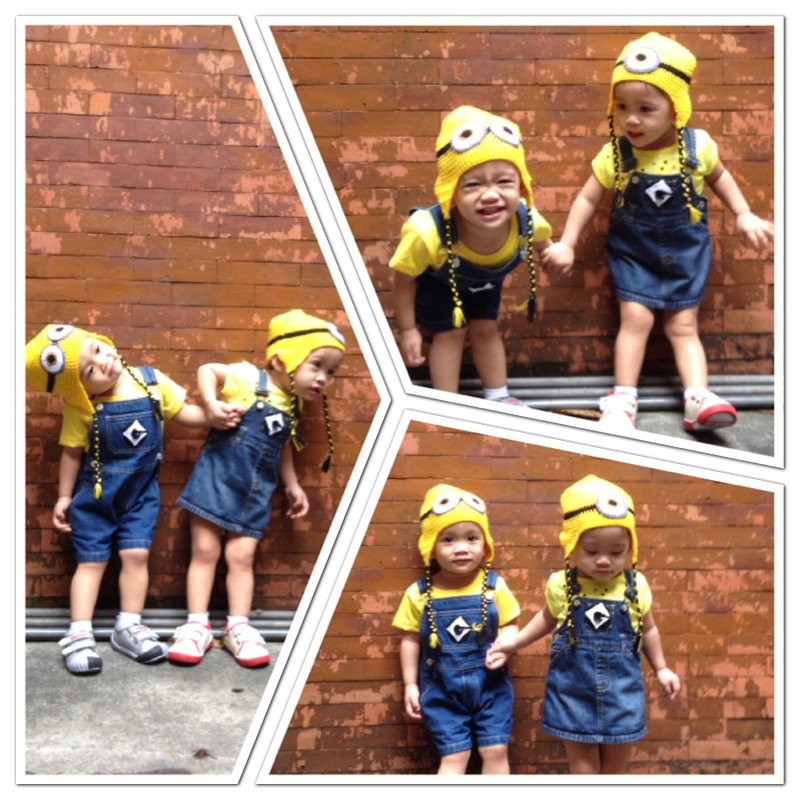 Voila, cute minion twins! Boo: We arrived late for the event, triggering a domino effect of other mini-boos. Arriving late couldn’t be helped, though, because that’s how the twins’ nap time worked out. We were actually able to catch the actual start of the program, but before that, early registration had already come and gone and a lot of things have happened: opening of the sponsor booths, distribution of food and early bird goodies, assignment of groups and numbers for the kiddie costume contest. Most of the chairs and tables were also already occupied. My apologies and thanks go to the volunteer event organizers (especially Mommies Louisa and MBP founder Lani), who were all Mommy Blogger Philippines members and who of course also had a lot on their plate, for helping us find a table and catch up to what’s happening. Yey: The twins got to sample a variety of food, which they loved. Their favorites: pasta and popcorn. It was their first time to try popcorn too, and they gobbled it up! Boo: I got too shy and preoccupied to actually meet other mommy bloggers. Classic Rina-on-introvert-mode moment. Big boo indeed! But yeah, beyond exchanging tentative smiles with some of the other mommies at the event, I didn’t really get to meet anyone, except for the organizers that I had to hassle during our late registration. I think the twins did more socializing than I did. To be honest I got too frazzled with the whole arriving late and having nowhere to sit thing that it was a relief to finally sit down and just observe the proceedings, and watch the twins run around and enjoy things. 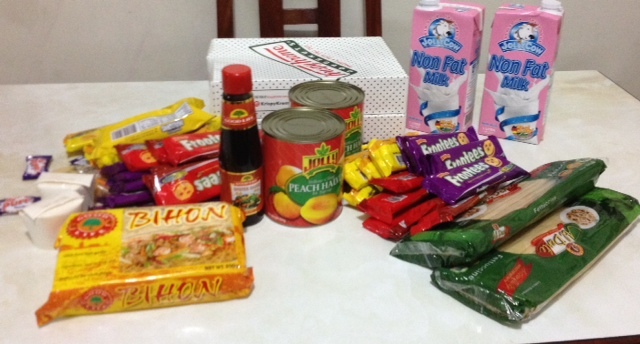 Yey: The trick or treat yielded treats for moms and kids alike. Glad to have been able to bring home a bunch of stuff from the event sponsors. Many thanks! There’s a mini-boo there, though: when they announced that it was time for the trick or treat, we joined the line with everyone else, and then I noticed that everyone else (or at least a lot) had pumpkin baskets or some sort of receptacle/container to put the treats in. I actually asked someone if the pumpkins were also distributed during the registration because I thought it was another thing we missed out on. As it turned out, they brought the pumpkin baskets themselves because, hello, it was a trick or treat event! So, yeah, I was totally unprepared with that. Told you I was familiar only with Undas customs! Thankfully, the generous package from Fly Ace Corporation came with its own loot bag so that became our de facto pumpkin basket. Boo-yey: We got a ride-all-you-can pass from Fun Ranch, which we immediately used after the party. Alas, either the twins were too tired because they’d enjoy the ride at first and then would start fussing and asking to get off. But still, it’s a new experience for them, and I’m glad they got to try it! 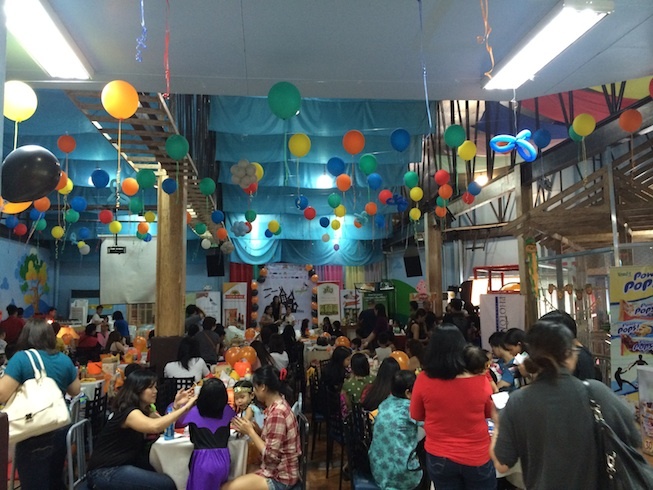 Many thanks again to Mommy Bloggers Philippines for this event, and I hope to really meet more of you next time! go ahead, hindi ko naman trademark ha ha! and it’s fun and totally doable! I love the costume, so cute. Last year my son wanted Minion costume but I couldn’t find blue jumper. I saw your minions during the party. We’re you at the back? You must have seen me with my samurai. Sayang I didn’t get to meet you! I’m glad you and your family enjoyed! Also glad to hear that we were able to assist you. We were a bit frazzled and overwhelmed! Hopefully next year we’re better prepared! I hope more yays than boos! 🙂 Hahahah! Anyway, the most fun part of the event is seeing kids run around and play. Such a chaos! Your minions are so cute! My son had fun just being around other kids in costume. Yey to the organizers who did a good job planning the event. Another post of the party I missed! Glad everyone had fun! Sayang talaga I missed this event! I would have loved to meet all you mommies in person! good to know I wasn’t the only shy one! maybe next time we should make a pact to at least talk to each other haha. and oh so that was your photobooth, so nice of you to sponsor that, thanks! thank you! and yes, the bagets also took up much of my attention too. typical, ha ha!